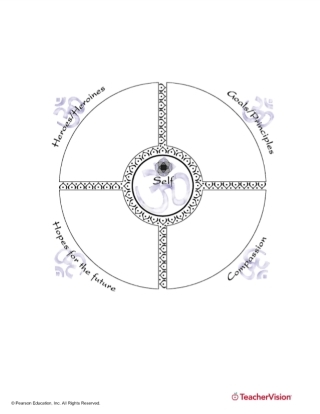 Get to know yourself, and others, with this fun personal mandala activity! The word mandala originates from the Sanskrit word for circle. A mandala contains symbols of a person’s inner self, guiding principles, and overall ideas about the world. The significance of objects within a mandala is conveyed by shape, size, and color - and are usually abstract designs or specific drawings of people, places, and ideas that are central to a person’s life. In this icebreaker, students will construct and illustrate a mandala that reflects their personalities and ideas about the world. Using the sample template provided and common art supplies, students can create and share a personal mandala that helps them get to know both themselves and others around them.